No. 7 Chaminade lost its second consecutive Mission League home game Tuesday, surrendering a four-goal lead in the fourth quarter and losing to Crespi in overtime. Last week the Eagles fell 11-7 to visiting St. Francis. Chaminade led 9-5 entering the fourth quarter, but Crespi scored four unanswered goals in the first six minutes of the quarter, tying the score at 9-9 with 6:04 to play. Chaminade had multiple possessions and numerous opportunities to re-take the lead — including possessing for the last two and a half minutes of regulation — but the score held. Crespi’s Joe Abu Dalu won the faceoff to start the extra period, and the Celts called time out. On the ensuing possession, junior attack Jake Milkovich beat his defender to the middle, drew a slide and a dumped pass to senior Jack Doyle on the crease for the finish and the 10-9 victory less than two minutes into the overtime. After scoring its ninth goal with 1:43 left in the third period, Chaminade (10-6, 3-4) didn’t score again over the next 15:28 of clock time. Much of that can be attributed to the 5:30 p.m. start time and the low, setting sun: Seven of Chaminade’s nine goals came in the first and third periods, when Crespi goalie Noah Davila was staring into the sun. Likewise, Crespi scored seven goals in the second and fourth quarters, when Eagles goalie Andy Dyer had to contend with the sun. As it happened, Dyer was looking into the sun in the final period. Senior Connor Leste started the Celts’ comeback, scoring unassisted with 10:29 to play. Then Doyle found Connor Pierce on the doorstep at the 8:57 mark and Rafa Francisco at nearly the same spot 20 seconds later, making the score 9-8. Leste tied the game 9-9 with an unassisted goal at 6:04. Pierce led Crespi (2-13, 1-6) with four goals — he has 12 in the Celts’ last three games — and Leste scored three. Doyle had a goal and two assists, and Francisco and Ryan Milkovich each scored one. Senior Ryan Oaks scored three goals to lead Chaminade, and Mac Griffin scored two. Mitch Kalkwarf, Max Kim, Owen Larson and Charlie Griffin each scored one. Chaminade wraps up its regular-season schedule with a visit to No. 2 Loyola on Saturday. Crespi faces visiting No. 20 Culver City in a nonleague game Wednesday, then wraps up the regular season Saturday at No. 4 Harvard Westlake. 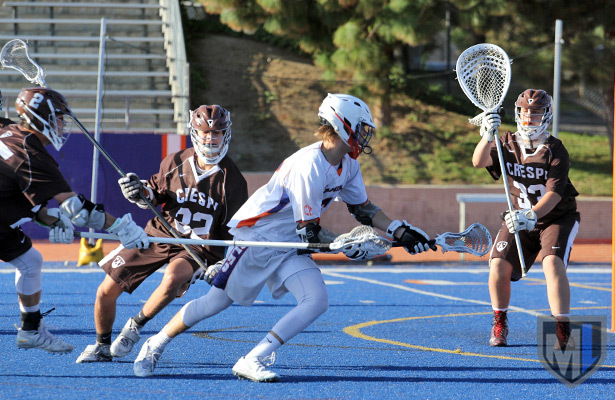 Although it has been a tough year for Crespi Lax this year, our kids continue to fight and play hard…resulting in victories our last three games. Thank you Coach Livingston for making our kids better lacrosse players, but more importantly, better men!